Unfortunately, this caused me great concern. Here’s why. SunBreeze Oil & SunBreeze Balm penetrate quickly for deep, soothing relief. Dermal absorption is the transport of a substance from the outer surface of the skin into deeper layers of the skin and the body. Studies show that our skin absorbs constantly, even without our awareness. In some cases, the skin may represent the most significant exposure pathway. Many commonly used chemicals in household and health & beauty products could potentially result in systemic toxicity if they penetrate through the skin. Then they enter the blood stream and cause health problems away from the original site of entry. The rate of dermal absorption and affectation of other areas of the body depends on many factors. The main factor is the epidermal or outer layer of the skin. The purpose of this layer is to a gatekeeper that prevents molecules from passing into and out of the skin, thus protecting the lower layers of skin and the bloodstream that feed the rest of the body. The extent of absorption also depends on several factors including any existing skin allergies, infections, injuries, irritants and the overall health of the individual. The more product that is applied and the longer that product applied causes long term absorption into the body. Most over the counter health, beauty and medicinal products are not fully regulated by the FDA. Manufactures are allowed to use ingredients and materials without the FDA’s review or approval. This means that you are being exposed to thousands of chemicals in everyday products. Many of these ingredients are carcinogens and contaminants that can be harmful and even deadly to humans. These ingredients can affect reproductive health and the health of an unborn child. Simple. The Ingredients in SunBreeze are better than any other products. 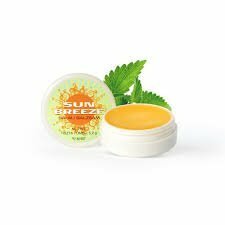 All natural SunBreeze Balm has soothing health benefits. SunBreeze is made from a proprietary blend of all-natural ingredients. These ingredients are hand cultivated and carefully processed by Sunrider. Sunrider owns the manufacturing facilities and oversees the entire process with strict quality controls throughout. This ensures that the final product maintains the superior quality and life essence of the herbs and plants. It also ensures that SunBreeze Oil and SunBreeze Balm products remain potent, safe and pure.SunBreeze Oil and SunBreeze Balm are made with organic ingredients like Mint extract, Cassia (Chinese Evergreen Tree – Cinnamon) and Eucalyptus Oil. These botanicals have been used for hundreds of thousands of years, especially in ancient Chinese cultures, to treat and relieve painful muscle and joint ailments; alleviate arthritic pain, soothe the mind, relieve tension headaches and stress; and, calm the body and the soul. SunBreeze is highly effective and will not cause adverse effects. It promises only pure, powerful pain relief designed to heal and restore the entire body naturally. Is SunBreeze Oil safe for my child or baby? Sends soothing relief to tired, sore and sprained muscles and joints. Great for the gym, yoga or other exercise regimens. Relaxation before sleep: add a few drops to bath water and on linens. Soothe the oil or balm on the temples or forhead for relaxation throughout the day and before sleep.